As riders, teams, media and fans turn their attention and vehicles south for the long transfer from Brittany to the Pyrenees, we here at The Jersey Pocket are usinge the break from racing to take our regular look at the action so far..
As with the 2015 Giro, this race has been designed to encourage GC racing from the start and it has been action and incident-packed since the first day when BMC’s Rohan Dennis took the first leader’s yellow jersey ahead of more favoured opponents such as Tony Martin, Fabian Cancellara and Tom Dumoulin in the only Individual Time Trial of the whole race. Host city Utrecht had a hard act following Yorkshire’s “Grandest Grand Départ” – and no amount of oversized Miffy’s were going to change that – but the passion of the Dutch for cycling (and their love of normally cycling-friendly traffic furniture) shone through nonetheless. Local man Dumoulin would have been the popular choice for the first yellow but Dennis’ record-beating average speed of 55.446 kph was a worthy way to kick-off the latest edition of the biggest bike race of them all. It looked like Ettix’s to lose and, as with other races earlier this season, they expertly contrived to do just that; leaving Cav high and dry at the front of the race with 500m still to go. He ran out of gas before the line, allowing Greipel past for the win, Sags for second and (crucially for his team mate Tony Martin’s chances of taking the yellow jersey) Fabs for third. The old lion gratefully donned yet another maillot jaune and looked set to enjoy a fair few days at the head of the peloton as the route took on a succession of “Spring Classic” style stages across Belgium and Northern France on its way along the Channel coast. But things were about to crash down around him and reset the race for many. Lotto-Soudal’s Adam Hansen had already suffered a reset on Stage Two – crashing hard and dislocating a shoulder that threatened his ability to continue in his 12th consecutive Grand Tour. The crash that affected Stage 3 however, on the road to the stage finish on the famous Mur de Huy was of a completely different scale. A touch of wheels at a tailwind-driven 70kph brought down a huge swathe of riders in an awful melee of limbs, frames and wheels. Cancellara’s specially painted yellow bike was highly visible cartwheeling across the destruction and though he finished the stage Fabs was later confirmed as having re-broken the same two vertebrae that he had cracked early in the season. The crash also proved to the end of the road for FDJ’s William Bonnet, Dumoulin, Katusha’s Dmitry Konzontchuk and both Simon Gerrans and Darryl Impey of OGE. It also lead to the race being stopped for a few minutes whilst medical cover could be guaranteed for those who were racing onwards.. Incredible footage taken by their team mechanic as he arrives on the scene shows the aftermath of such a crash in a whole new light..
On the Mur itself Chris Froome showed himself to be the strongest of the main contenders, initially splitting the bunch and then almost catching Joaquin Rodriguez who bounded away for the stage win. For the second time in two days, Tony Martin was denied the overall race lead by bonus seconds, but this time the gap to the leader – Froome – was just a single second. Getting into the yellow jersey so early was an unexpected surprise for the Team Sky man – and it was clear that he did necessarily expect (or want) to hold it for very long so early in the race – but it did at least mean that his support car would be first in the line should he need it the following day on the eagerly awaited cobbled stage to Cambrai. Vincenzo Nibali’s imperious form on the cobbles in 2014 had given almost everyone the expectation that the Italian would once again rule the pavé and put some significant time into his rivals. Although the Astana man did repeatedly force the pace throughout the traversing of the seven cobbled secteurs he could not ‘snap the elastic’ and force a genuine selection. Indeed, if anything, it was Froome who doomed the imperious mantle, with the kind of assured showing that many believed was beyond him. His displays of bike handling and spikiness when his position was threatened may have put the last nail in the long forgotten “Crash Froome” moniker that dogged his early years. Quintana and Contador were more ragged in their raids across the cobbles but both held on to the rapidly decreasing front group and recorded the same time overall. With the rough stuff passed it looked for a moment as though Froome and his super-strong lieutenant Geraint Thomas were going to make a two-up break for the stage win but they allowed themselves to be reabsorbed into the small bunch before Tony Martin, sensing that his moment of destiny had finally arrived, leapt away with 3km to run and held out to take a hugely pleasing win, which also netted him the yellow jersey he had been so close to since day one. The waltz across the cobbles did require some readjustment of the pre-race suggestion that the Tour was a straight shoot-out between the “Fab Four” by extending it to become a “Fab Five”. Pinot’s latest horror show (3 minutes lost and what looked like all confidence and focus with it) meant that it was not the Frenchman’s name being added to the Honour Roll but rather that of the American Tejay Van Garderen, who was shadowing Froome most closely. Stage 5 was a quiet affair for us viewers compared to those that had gone before – though the riders later suggested that the winds and constantly changing terrain were incredibly mentally-sapping – and Andre Greipel proved himself again to be the fastest sprinter by taking his second win. In doing so he also poured some rather cold water on the theory that the 30 year old Cav is too old to be a sprinter. Greipel is 32. The stage to Le Havre the following day seemed destined to be consigned to similarly small footnote status until an innocuous wobble in the last 900m turned into a massive moment for the day and the race overall. Tony Martin became unseated and started a slow motion games of skittles that took out Nibali, Quintana and a number of other riders. As it occurred within the last 3km no-one lost any time but as the riders picked themselves up and started to trundle towards the finish line where Martin’s Ettix teammate Zydenek Stybar was taking the stage win, one man stayed seated with the classically stricken pose of a broken shoulder. As he was wearing yellow all the focus was on him. Martin did remount and was painfully pushed to the finish by his other team-mates but the writing was on the wall for all to see and, sadly, he did not start the following morning. Stage 7 therefore had no yellow jersey, as an uncertain mixture of respect from Chris Froome and protocol from the UCI left it vacant for the day. The race lacked a visual focus as a result so many chose to concentrate instead on the remarkable story of Daniel Teklahaimenot, whose capture of the King of the Mountains jersey the day before had prompted much interest. Hailing from Eritrea, the MTN-Quebeka was erroneously described as being the first African to wear a leader’s jersey but it remains an excellent achievement for him and his team who are doing so much to raise the profile of the African continent through their riding and charity work. At the day’s denouement Cav finally got the win he had been waiting almost two years for as he out -thought and and then out-paced Greipel on an uphill sprint that was neither really their preferred territory. With Marcel Kittel a non-starter in the Tour due a season blighted by illness, and Nacer Bouhanni also falling victim to an earlier crash, it had been left to these two to duke it out, with the ever present Peter Sagan rounding out the daily battle. Cav’s timing for both the sprint itself and this win were excellent. With sprint stages hugely limited this year, this could be the last time we see them until the Champs Elysees. It was a return to more expected (this year at least) week 1 fare for Stage 8, with another ‘sting in the tail’ finish that paid homage to the Spring Classics. This time the Mur de Bretagne stood in the for the Mur de Huy, swapping the tactically- challenging 19% twists and turns of Belgium for a dead straight 10% drag-race in North-Western France. Froome, now back in maillot jaune once more, set his turbo whirring at the base of the long climb and again looked to have the beating of most. As the TV cameras focussed on him, and stage favourite Dan Martin (who had once again left his challenge on the Mur de Huy too late), Alexis Vuillermoz – third on the Belgian berg – escaped on the opposite side of the road and no-one except Martin could answer. But the often blighted Irishman’s luck deserted him yet again. He was momentarily boxed in and could not escape until the Frenchman had a decent lead. Vuillermoz’s exhaltant celebration as he crossed the line may have been almost lost in shadow but Martin’s thumping of his handlebars in deep frustration were plain to see. On GC Nibali lost ten more precious seconds in what was now becoming a familiar routine. The end of the stage brought some less welcome news – the first drugs controversy of the Tour. Katisha’s Luca Paolini, a hugely popular veteran of the peloton and winner of this years attritional Ghent-Wevelgem, had tested positive for cocaine on Stage 4. He was ushered off the race with an immediate suspension and we what t hear if he will contest the charge with a second check on his B sample. With Froome’s lead over second place man Van Garderen just a slender 13 seconds, it was expected that Sky might surrender the lead once more in the Team Time Trial that preceded the first rest day. Positioned unusually late in the race the TTT was already framed as no more than an exercise in survival for some crash-ravaged teams. OGE in particular looked extremely vulnerable having had their roster reduced even further by the abandonment of Michael Albasini on Stage 6 and with Michael Matthews literally struggling just to even get onto his bike each day. It was no surprise that they finished last. 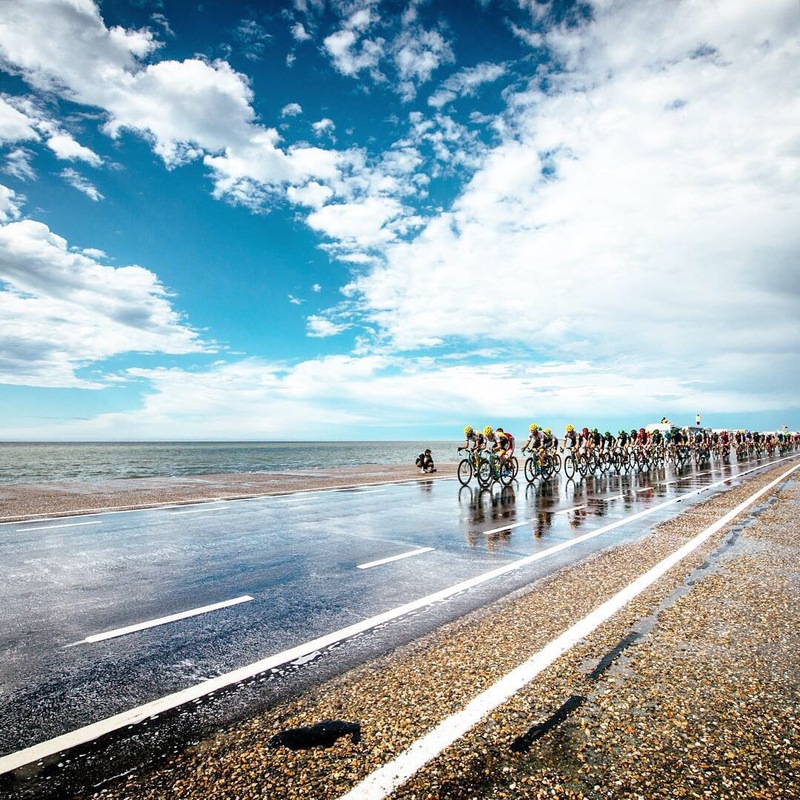 At the pointy end of affairs Movistar put in a great ride – again despite of their TT specialist Alex Dowsett not being able to contribute properly having crashed on the cobbles – and stayed within 4 seconds of Sky and BMS who ended the day just a single second apart. They were both expected to go well and out was the American/Swiss team who just shaded it, winning the day but nit taking the overall lead. Astana again looked ragged – such a contrast for the super-tight unit who contested the Giro – and Nibali slipped further behind to 2’22″behind race leader Froome. As the riders took their quick flight to the South of France (and the teams and media began to contemplate their far longer vehicular transfer) it was he who must have been feeling least pleased with Week 1. Of all the favourites Nibali was expected to fare best in the opening exchanges and instead has found himself staring at a large deficit that will not be easily rescued. From here, a place on the podium seems a tough call for the Italian. Contador has had a relatively quiet week; almost always in the mix but without ever threatening to attack or extend. Still recovering from his Giro exertions, this is to be expected. Quintana will be pleased- despite losing time in the Stage 2 crosswinds. This was the week he was supposed to suffer and he has held his own remarkably well, performing well enough on the cobbles and in the time trials. He is still almost two minutes back on Froome though, who must be pinching himself at how well this week has gone. He has been on the right side of every move, forced the pace at every turn and looks every inch the contender he was in 2013. The pace of the racing will change now. The rest of the route to Paris is relentlessly mountainous and huge swathes of time will be gained and lost by riders each day. The ascents made so far have been mere molehills compared with what is to come. And it comes soon, starting tomorrow with the first summit finish of this years race, atop the brand new hors category climb of La Pierre-Saint-Martin. Don’t miss it! GC – Chris Froome (TEAM SKY) 31:34:12; Tejay Van Garderen (BMC RACING TEAM) +0:12; Greg Van Avermaet (BMC RACING TEAM) +0:27; Peter Sagan (TINKOFF-SAXO) +0:38; Alberto Contador (TINKOFF-SAXO) +1:03. Points – Peter Sagan (TINKOFF-SAXO) – 213; Andre Greipel (LOTTO-SOUDAL) – 210. Featured Images from the incomparable Jered & Ashley Gruber’s Twitter timelines. Please check out their work. It is sublime. 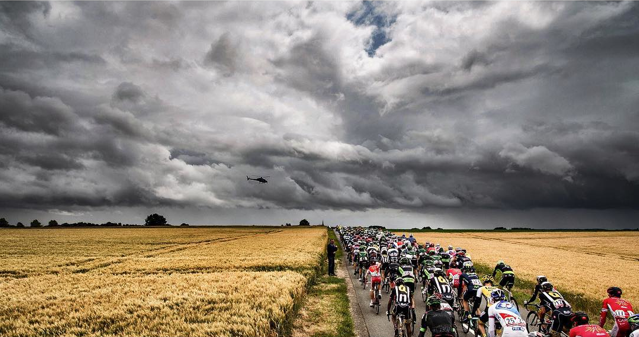 This entry was posted in Le Tour de France and tagged astana, Belgium, bmc, Cancellara, cavendish, contador, Cycling, dumoulin, France, froome, grand depart, Grand Tour, greipel, movistar, mur de huy, nibali, orica greenedge, quintana, sagan, team sky, Tour de France, van garderen. Bookmark the permalink.